The perfect place for fast, fresh Mexican style food, a discounted Moe’s gift card is a sure win! With a menu that includes burritos, tacos, quesadillas, nachos, salads, stacks, and burrito bowls, you’re sure to find something for everyone in your group. What’s more, everything is freshly assembled right in front of you, to your specification. If you have never dined in Moe’s before, and you love Mexican food, then you are missing out! Buy your discounted Moe’s gift card today and find out for yourself why, in 2016, the Harris Poll voted them the “fast casual Mexican restaurant of the year.” Great food, fun pop culture environment, and reasonable prices- what’s not to love? And just think, you’ll pay less on your entire purchase! Founded in Atlanta, Georgia, in 2000, they have become an instant success. In fact, within 15 years, they had grown to include over 600 locations in 38 North American states. You can use your discounted Moe’s gift card at any one of these locations, anytime. And don’t forget, they offer catering, as well! Save money on your next big event and serve great food that includes grass-fed sirloin, organic tofu, and all-natural chicken. For even more savings, join the Rockin Rewards to earn redeemable points on every purchase you make. You’re just a click away from eating great food and paying less money for it! Not only will a Moe’s gift card save you money, but Cards2Cash offers discounted gift cards for many other restaurants! 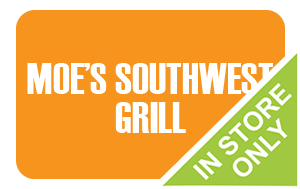 Be sure to check our listings for Chipotle, Qdoba, Taco Cabana, Baja Fresh Mexican Grill and more! What’s’ more, we also offer cards for many retail shops, websites, and services! With Cards2Cash, saving money is simple! Do you have a Moe’s gift card you aren’t going to use? Sell it to Cards2Cash! We’ll pay top dollar for it! If interested, just stop in one of our retail locations for immediate cash, OR fill out our easy online form and we’ll get back to you with an offer! Cards2Cash is your one-stop gift card shop!